Most events are legally required to provide medical and safety coverage for participants, staff, and attendees. Of course, you want more than just to protect yourself from legal repercussions. You’re looking for the peace of mind that comes from knowing your event is prepared for any contingency. Medical staffing and coverage needs can be a bit opaque, though. Do you just need EMTs, or will specialty responders fit your event’s needs better? Read on to find out the wide variety of responders Joffe Emergency Services provides for our event partners. We will ensure you get exactly the person you need to handle YOUR event, not just an event. Emergency Medical Technicians (EMTs): We love our EMTs! Joffe-certified EMT partners are proactive, focused, and friendly. Place them throughout your event and you can feel confident that they will be first on the scene, ready to treat illnesses and injuries of all kinds. Most events of at least moderate size will require around 2-4 EMTs. Lifeguards: Have a water feature at your event? No? Well, then you probably don’t need lifeguards. Everyone else, however, may need our trained lifeguards on duty. We often deploy lifeguards for races and competitions that have a water obstacle on the course. Rescue Divers: Another group of water-specific responders that we provide to our partners are rescue divers. If the water stands higher than the average participant’s shoulder, rescue divers are needed. They remain in-water for the duration of an event and coordinate rescues with lifeguards. Physicians (M.D. ): Okay, let’s move back to dry land. At events that consistently deal with advanced injury and illness, physicians serve as a crucial stabilizer of patients on-site before they are transported by ground or air to a local hospital. They also serve as the main point of communication between the event medical staff and the emergency room where the patient is delivered to. Registered Nurse (RN): Working hand-in-hand with the physician are registered nurses. Both physicians and nurses are stationed at a field hospital on-site. Joffe-certified nurses are crucial in a serious medical situation. Their trained eye is utilized to perform triage on patients, determining the priority of treatment based on the severity of the injury suffered. In addition, a RN assists the physician with advanced medical treatment, escorts patients to the local hospital when needed, and provides basic medical care when cases can be handled at the event. Spotters: Spotters are trained and briefed in order to proactively identify injuries and illnesses. They are stationed where they can observe potential/likely trouble spots at the event as well as other medical personnel. This allows them to immediately notify an EMT, for example, of the location where medical care is required. Hiring spotters will enhance your medical coverage at any event. Supervisors: Joffe supervisors are fully prepared to execute the range of responsibilities incumbent upon them. Over the course of a full event day, a supervisor may stand-in for an EMT during a bathroom break, provide medical care themselves if an incident happens near them, and keep their team focused and healthy by providing water, food, or shade. Of course, they also monitor team quality and make sure everyone remains pointed towards achieving the goal of a safe event. Believe it or not, this isn’t even the full list of available responders ready and willing to improve your event’s safety. Joffe works with Certified Nursing Assistants (CNAs) and paramedics as well. We hope you feel a bit more informed as to what your particular event will need to be as safe as possible. 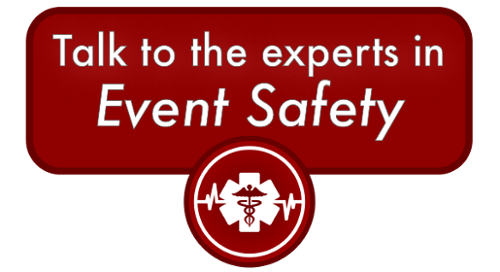 Check out some of our other articles regarding event safety below, or check out our programs page here to find out how Joffe can take medical and safety related stress off your plate and let you get back to what you do best--planning an awesome event. Did this pique your interest? Learn more about how Joffe can assist with safety at your event by clicking the button below!